A Chinese proverb says: "a man is not a stalk of grass or a tree, he is a sentimental creature". As a matter of fact, this is entirely wrong; because plants also have feelings and various emotions, they even have languages, music or dances etc. ; only that they express these in special and unique forms, which are not easily identified by common people. Sensitive plant Linn is one of the most typical grasses that have emotions. Sensitive plant Linn is a perennial herbal plant. It could grow as tall as 1 meter and it also has thorns on its stalks. Its flower is round, light red, and the size of the flower is like beans; the flower has no pedals, and consists of many pistils, which look as if hairy balls; as soon as its leaves are touched, they would close and sink down like a beautiful and shy Dai girl who covers her face at the sight of a handsome young fellow. Why could sensitive plant Linn feel shy? In the base of its leafstalk and the base of its double leave, there are two bulging parts. They are the stergrimas, and are quite sensitive to stimulations. In the center of the stergrima, there is a vascular bundle; when people touch the leaves, the stergrima would bring the leaves together, thus the leaves would dropped. After a while, the stergrima would be filled with cell liquid again, the pressure increases and the leaves would open again. The leafstalk would stand up and everything would restore to the original appearance. This special feature of the sensitive plant Linn is its adaptation to the unfavorable environment of the outside. The native land of sensitive plant Linn is in Brazil of South America. There are frequent storms there. Every time when the first raindrop falls on the leaves, the leaves would close immediately; and the leafstalks would sink, thus avoid being damaged by the storm. 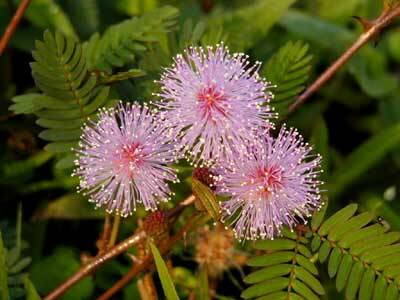 The whole plant of sensitive plant Linn is poisonous and could be used as medicines. It has the effects to make people calm down and to stop bleeding. If the leaves are pounded when fresh, they could cure zona. It originates in tropical areas of South America, and now scatters in all tropical areas on the globe. It grows in Yunnan, Guangxi and Guangdong in China.